Bronze Die rougher texture holds more sauce. 100% durum wheat. Low fat. 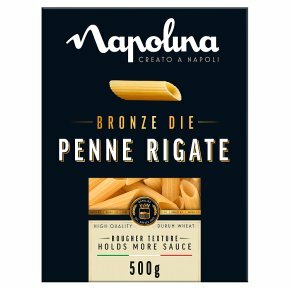 Suitable for vegetarians.Extruded through traditional 'bronze dies' creating a textured pasta with a rough surface, allowing sauces to stick for a fuller flavour. Add pasta to a large pan of slightly salted boiling water, return to the boil and cook for 12-13 minutes according to taste.A shorter cooking time will create a firmer authentic Italian texture ('al dente' meaning 'firm to the bite'). Drain and serve with your favourite Napolina pasta sauce.